The British Prime Minister is expected to force a vote on the issue as EU leaders meet today. BRITISH PRIME MINISTER David Cameron said Jean-Claude Juncker is the “wrong person” to head the European Commission, as he arrived for an EU leader’s summit in Brussels. The meeting is expected to overwhelmingly confirm the former Luxembourg prime minister’s appointment. 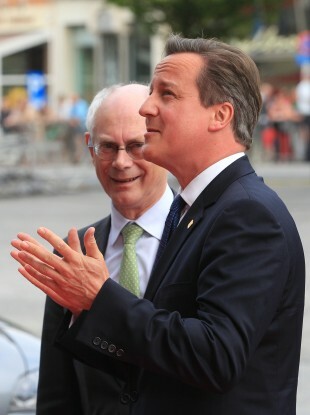 “He is not the right person to take this organisation forward,” Cameron insisted. Speaking in the Dáil this week, Taoiseach Enda Kenny said he expected Junker to be confirmed as the nominee. He said that, though he was aware of reservations in the UK, he was confident the Luxembourg politician had both “the qualities and experience required for the job”. The disagreement comes a month after anti-EU parties made sweeping gains in European elections, with outright victories for the UK Independence Party in Britain and the National Front in France. German Chancellor Angela Merkel, Europe’s most powerful leader, yesterday urged EU colleagues to “compromise” with Britain to defuse tensions. Away from disagreements over top jobs, European leaders are also set to discuss the conflict playing out on their doorsteps in Ukraine. Ukraine, Georgia and Moldova are set to sign landmark association and free trade accords with the EU. The pact, which will be signed by Ukraine’s new President Petro Poroshenko, has been at the heart of a months-long crisis in Ukraine and is fiercely opposed by Russia. Moscow said yesterday that it hopes to be able to raise its concerns over the agreement in talks between officials this week ahead of a ministerial meeting next month. Email “Cameron not backing down from EU showdown over Junker vote”. Feedback on “Cameron not backing down from EU showdown over Junker vote”.